Bryan Pijanowski’s passport is overstuffed with visas from some of the world’s most far-flung outposts. As a professor of soundscape ecology in the Department of Forestry and Natural Resources and director of the Center for Global Soundscapes at Purdue’s Discovery Park, he has journeyed from the lush rainforests of Costa Rica to the wide-open, gently rolling landscapes of Mongolia’s eastern steppes, in an effort to preserve and analyze the sounds that define life on Earth. In Borneo, he traveled up the winding Temburong River to spend months deep in the oldest forest on Earth, recording sounds at the top of a 250-foot tower to compare sounds in the canopy to those on the ground. In Costa Rica, his microphones recorded the calls of nearly 1,000 different animal species in one of the most biologically diverse ecosystems on the planet. On a recent expedition to a remote Tanzanian research station, he studied the vocalization patterns of baboons, chimpanzees, monkeys, and bushbabies in the world’s largest woodland biome. He has experienced the vast wonder of nature from the tops of glaciers to the depths of coral reefs. At Purdue’s Center for Global Soundscapes, Professor Bryan Pijanowski leads the study of the natural and manmade sounds that define our ecosystems, and what changes in those soundscapes can tell us about the health of our landscapes and native species. Two examples: The sounds inside a glacier can reveal information about the physics of the glacier, including its size, formation, and movement. And in some cultures, ranchers can identify the sounds of individual members of a herd. In the past four years, the center has installed more than 3,600 audio sensors in 27 sites worldwide, collecting more than 1.2 million recordings totaling 250,000 hours of sound. Center projects include Vanishing Soundscapes, which monitors soundscape ecology in protected and high-value ecological areas like parks, monuments, and reserves, and a Midwest Initiative to collect and catalog natural sounds in the north-central United States. For the Record the Earth project, citizen scientists can use an app to record and submit soundscapes from anywhere across the globe. The sounds around us also help shape our psychological attachment to and relationship with the places we know. Download the “Record the Earth” app for iOS or Android to record and submit sounds from your landscape, and listen to soundscapes from across the globe. As a pioneer and leader in the field of soundscape ecology, Pijanowski expands the frontiers of environmental research. His work has been covered by global media outlets such as CNN, NPR, and PBS, and was the basis of a feature film, “Global Soundscapes: Mission to Record the Earth,” shown at IMAX theaters throughout North America. 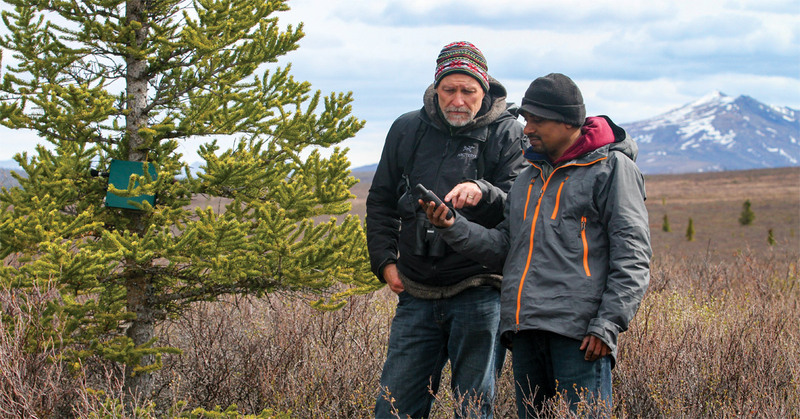 Bryan Pijanowski, professor of soundscape ecology, works with Buddhika Madurapperuma, a postdoctoral researcher from Humboldt State University, in Denali National Park, Alaska. 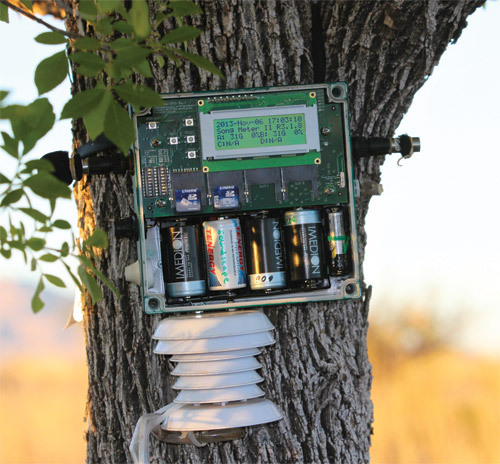 They used a global positioning system to capture the location of a passive acoustic recorder that will record how rapidly changing day length affects the timing and structure of the dawn chorus. The term “soundscape ecology” was first used in the late 1970s to describe the study of the natural and manmade sounds that define an ecosystem, from the throaty croak of a colony of frogs in a rainforest to the seismic roar of a landslide down a mountain, or even the steady hum of automobile traffic from a nearby highway. Changes in a soundscape over time, especially those resulting from human activity, can provide researchers with vital information about the health and development of the native plant and animal species in a habitat. As an ecologist and an accomplished amateur musician, Pijanowski was quickly drawn to the new science of soundscapes. He had long been fascinated by the interplay of sounds in nature and how those sounds helped to shape people’s attitudes about a place. His own memories are dominated not by things he has seen, but what he has heard. When he thinks back on a childhood fishing expedition with his grandfather in the deep woods of northern Michigan, for example, it is not the sensation of a cool morning dew on his skin or the aromatic scent of the pine trees that he recalls, but the sounds—the splash of wooden oars against the placid surface of the lake, the creaking of the aluminum hull as the boat rocked in the gentle current, the whir of the reel unspooling during a cast, and the soft plop of the wooden bobber hitting the water. Pijanowski pursued his interests in science and art at Hope College in Michigan, fitting in as many music and literature courses as his tight schedule would allow. He earned a PhD in zoology at Michigan State University, where he was an associate professor of entomology and zoology specializing in animal behavioral ecology before joining the Purdue faculty in 2003. Sand blows across these Khongoryn dunes, called the “Singing Sands,” in the Gobi Desert, Mongolia. Their sounds include a low pulsating hum that is combined with high-pitched ringing overtones, and are spiritual to local camel herders. Some of Pijanowski’s research focuses on how natural sounds are part of the ecological knowledge of local people. He led the development of the Center for Global Soundscapes in 2014, funded with $3 million in grants from the National Science Foundation, Purdue’s Office of the Executive Vice President for Research and Partnerships, Discovery Park, Purdue’s Center for the Environment, the National Park Service, the National Oceanic and Atmospheric Administration, the Indiana Department of Natural Resources, the Envision Center, and Information Technology at Purdue. The center’s mission is to support discovery, learning, and engagement activities to preserve the world’s acoustic heritage. Over the past four years, researchers from the center have installed more than 3,600 audio sensors in 27 sites throughout the world, amassing a collection of more than 1.2 million recordings totaling about 250,000 hours of sound. Many of those recordings are available on the center’s website. “Our goal is not just to collect data, but to educate and engage people, to get them thinking about how their actions impact the environment and their own relationship with their natural surroundings,” Pijanowski says. After you answer, be sure to scroll down for the explanation and click “next” for another question. The center first gained international attention in 2014 with an Earth Day project, when Pijanowski and his team recruited citizen scientists from throughout the world to record short audio clips of their surroundings using a mobile application Pijanowski designed. More than 3,900 recordings were collected from 112 different countries. The cover of this passive acoustic recording device is removed to show the programmable interface, batteries, and SD cards for data storage. Solar radiation, air temperature, and relative humidity sensors are also attached. The next major initiative was the Vanishing Soundscapes project, which focuses on areas with high social and ecological value such as the Chiricahua National Monument in Arizona, Kuala Belalong Field Studies Centre in Borneo, Platte River Basin in Nebraska, Wells National Estuarine Research Reserve in Maine, La Selva Biological Station in Costa Rica, the Denali region of Alaska, and Aldo Leopold Reserve in central Wisconsin, considered by many naturalists to be the birthplace of the modern environmental movement. Closer to home, the center’s Midwest Initiative was launched to collect and catalog the natural sounds of the north-central United States, a geographically, socially, and economically diverse region ranging from the grasslands of Nebraska’s Platte River Valley to the industrial centers of the Great Lakes. Other projects are underway to record the “wild sounds” of Chicago and the Connor Prairie Interactive History Park near Indianapolis. In early 2017, Pijanowski led an expedition to place marine acoustic sensors in three diverse coral reef systems off the southwest coast of Puerto Rico. The sensors will record for an entire year, likely capturing the temporal patterns of whale songs, he says, as well as the calls of porpoises, fish, sea urchins, and lobsters. 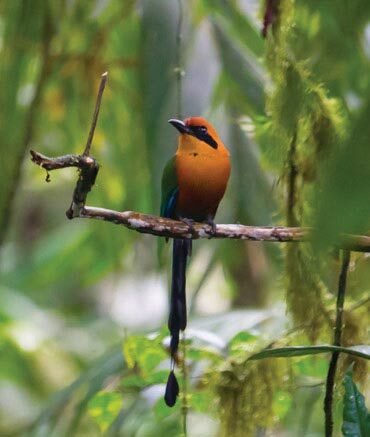 This Rufous motmot’s soft “boo-boo” call can be heard throughout the La Selva Biological Station in Costa Rica. Pijanowski’s team is using soundscape diversity measures to assess how forest stand age affects animal biodiversity patterns. During the August solar eclipse, Pijanowski and his team put out a call for citizen scientists to record the sounds of wildlife in their area in an effort to better understand how an unusual period of darkness would affect the animals’ circadian rythms. The response, he says, was encouraging, with thousands of recordings submitted from throughout the country. Pijanowski’s latest venture, however, is perhaps his most ambitious yet—developing a common research strategy and tools to help artists, scientists, engineers, and others address some of the major environmental, social, and economic issues facing humankind in the 21st century. In early June, Pijanowski and a team of 17 colleagues, including social scientists, ecologists, and musicologists, traveled to the remote Altai region of western Mongolia to study the impact of environmental change on the native Turkic people. Pijanowski chose this region with its rolling green valleys, soaring plateaus, and jagged mountain peaks because he’d been there before, in 2015, during production of the IMAX film. He remembered the idyllic setting and the rocky outcrops that provide almost perfect acoustics as a natural amphitheater for the traditional native practice of throat singing, in which performers mimic and celebrate the sounds of nature. And he remembered the deep spiritual connection Mongolian herders had with their surroundings. For two weeks, team members lived with native people, sharing their meals and chores, talking in great detail about their cultural practices, and camping out like traditional Mongolian ranchers under a vast sky that Pijanowski describes as “a shade of blue you have never seen before.” It was, he says, a transformative experience, personally and professionally. Pijanowski and his team organize annual workshops, funded by the National Science Foundation, to train researchers in the use of tools and perspectives in soundscape ecology. Participants from over three continents and 12 universities met at this workshop at the Aldo Leopold Foundation in Baraboo, Wisconsin. After questioning him more, Pijanowski realized that the landscape of the elder’s lifelong home looked and sounded different due to an increase in dust blowing across the Gobi desert-steppes, which in turn has an impact on the structure of plant and animal communities in the area. Changes in sound were indicators of the same environmental changes ecologists measure in different ways. 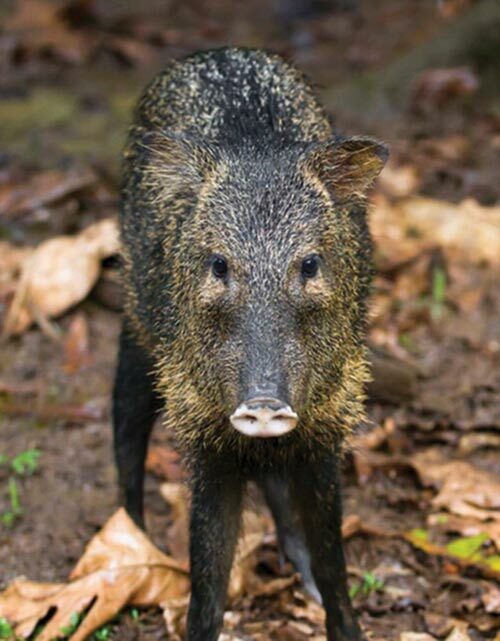 This collared peccary, recorded in Costa Rica, makes a range of noises, including snorts and barks. These animals have poor vision, so they use sounds to communicate with one another. Pijanowski and the other team members are continuing their collaboration, sharing notes and hoping to publish a paper outlining a new interdisciplinary approach for the study of humankind’s relationship with the acoustic environment. In the meantime, the ever-ambitious, ever-curious Pijanowski continues to explore new outlets for his diverse interests—composing poetry based on his field notes and writing a children’s book. He admits he isn’t certain what the future of soundscape ecology will be. Photos provided by Cris Bocast, Tom Campbell, Amandine Gasc, Matthew J. Harris, and Bryan Pijanowski.